If you have kids in high school who run cross country—or if you ran cross country—you might be intimately familiar with the Holiday Run course at Pioneers Park. There’s the wide-open start than funnels runners as they fly down the first of many hills. There are the trail crossings and roads that echo with the sound of spikes during a high school or college meet. There’s the wooded route through the Pinewood Bowl that leads to the Oven and ultimately to Choo Choo Hill. Choo Choo Hill is hard no matter if it’s a 53 degree December morning (like it was on December 3) or an 85 degree September afternoon. It comes late in the race, and if you have any energy left, you’re going to spend it on this hill and then enjoy your reward of a flattish straightaway to a slightly uphill finish. Now if you ran with your dog, it was probably a different race altogether. 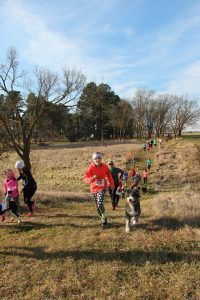 With approximately 200 dogs racing with 400 humans, it wasn’t so much about time as it was about a good time. Dogs in leg warmers, dogs in Santa suits, dogs in hats and bows, dogs pulling their owners through the park on a leash not fast enough. In a quick survey, at least fifteen dogs that ran had been adopted from the Capital Humane Society. And at least one dog was adopted after the race. Those are definitely the winners of the sixteenth annual Holiday Run! 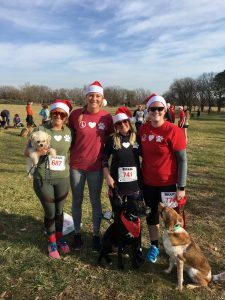 The Holiday Run raises money for the Capital Humane Society every year. This year the Lincoln Track Club donated $5,000. And that money plus the money raised in the past will help fund an adoption room at the Capital Humane Society’s Pieloch Adoption Center at 70th Street and Highway 2. 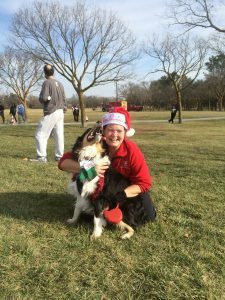 Thanks to everyone who ran and to everyone who has adopted from the Capital Humane Society. Pictures are on the Lincoln Running Company’s Facebook page.